Is Your Creativity Good Enough? The result of your creativity is always good enough at the time you are working on it. Creativity is the expression of oneself. You have to be the judge of when you are ready while fighting off your own worst critic – you. Your art-form may even buck the system. A good skill to learn is to dance like no one is watching. It is normal to care what others think, but they shouldn’t have a say in who you are as a person – and your creativity is you. Other traps to avoid are expectation and comparison. It is all too easy to place expectations on ourselves, sounding like, I should be able to … and This will be easy for me, etc. Disappointment is destined to follow when you discover you can’t (right now) and it isn’t easy for you yet. Comparing your work to another’s is equally bad. Even when you have their experience and training, you won’t have their unique creativity. Pairing expectation with comparison and you have a recipe for disaster. Only compare your work with your previous work and expect that you will get better. Oil-painting, sculpture, architecture, script writing and sketching, etc. the list goes on and on. What is your preferred medium to express yourself? 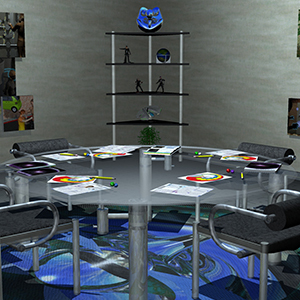 Ours is Three-Dimensional/computer generated imagery (CGI). It is kind of like creating an ashtray out of clay. We start with something (a line, a plane, a cube, etc.) in a 3D program and we use a variety of tools to model it into an object (the ashtray). We even get to ‘paint and glaze’ it. Where a kiln bakes the clay into the final, sturdy ashtray, a computer will ‘bake’ our object into what you see in our comic books, animations, role-playing books and cards. Our goal is to tell stories and have people interact with them. The Force RPG tells stories through a group process. Vymachi CCG tells a story through card descriptions and group play. We also tell stories through the recognizable style of comic books. Like you, we had to start somewhere. We started with the skills we had at the time and that is a good place for you to begin as well. Your artwork will evolve as you practice and learn new skills. Ask any artist and they will tell you their first works left much to be desired. I cringe a little (ok, a lot) when I look back on my creative past. I used to find something on my desk and try to recreate it in 3D. An evolving illustrator could do the same thing. To progress, I would research the software I used, read fellow designers blogs and look for anything that might help me make a better 3D model. You’ve probably heard of Van Gogh. His work evolved just like any artist – he started with dark tones and moved toward bright ones and ended up with a style of his own. Bakyew Sword evolution of design to model to 3D print. Share your work. Even if it just among your friends and family, share your work. The sense of accomplishment when getting a project/piece done is rewarding in and of itself. It feels even better when someone asks you “How did you do that?” Keep in mind what you know – even if just learning – may be – and usually is – more than your friends and family. And with that experience, you will learn that your work at this stage really is good enough. Now having the tools to show you how great you are, you can check out this link. It is an example where a movie was snubbed for doing something most movies do today. It set the stage for future movies and you may be doing the same with your creativity. Your creativity is good enough and now you get to make it great! Posted in Comics, Company, Roleplaying and tagged Pentavis.